Originally announced on February 14, the increase to $40 will take place on March 13 for anyone signing up for YouTube TV from that date onward. Existing subscribers and those who sign up before the subscription bump will continue to pay at the $35 rate for exactly the same package. The U.S.-only service is separate to YouTube's main user-generated content offering, instead providing live streams for a wide variety of channels from major broadcast networks, including ABC, CBS, NBC, and Fox, along with some sports and cable channels. As well as the basic package, subscribers can also pay extra for add-ons that include networks like Showtime and Fox Soccer Plus. At the time of the original price rise announcement, YouTube confirmed it was adding Turner network broadcasts to the service, adding CNN, TBS, TNT, Cartoon Network/Adult Swim, and other channels. NBA TV and MLB Network were also touted for addition to the base package, with add-on passes offering more sporting content on the way as well. Still absent from the roster is Viacom channels including Comedy Central and MTV, but despite Viacom's reported intention to create its own streaming service by September this year, it may still license its channels to YouTube TV in the future. 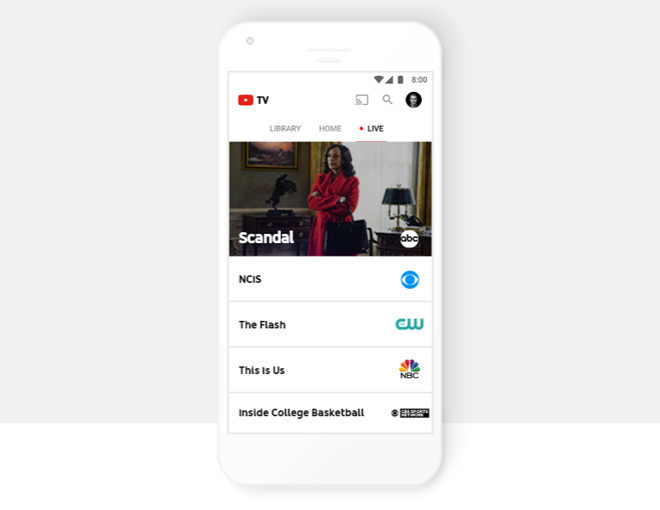 YouTube TV is currently available on a wide number of platforms, including the iPhone and iPad since launch, followed later by support for the Apple TV. Other platform options include Android, Roku, the Xbox One, and some non-Android TVs.